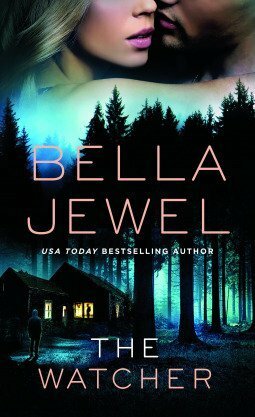 Bella Jewel managed to snare my attention right from the first page with The Watcher when she throws you into a nightmare, a nightmare that actually happened to our heroine, Marlie, when she was kidnapped and tortured by a serial killer. But some how she manages to kill her captor and escape. Now it’s years later and still haunted by her experience…and it all comes streaming back when her sister goes missing and she can’t help thinking that he is back and punishing her…but he’s dead, right? I loved this book! Jewel gives you a perfect mix of thriller and romance as Marlie goes on the hunt for her missing sister with the surly and silent Kenai, the private investigator she has hired to help her. Although both the romance and the mystery/thriller aspect of this book was fairly obvious from the beginning, that didn’t stop me from enjoying the book. I really liked Marlie’s character and the way Jewel built up the suspense. As for the romance, I love a grumpy taciturn hero who slowly has his walls broken down by the heroine. The reason I enjoyed this book, despite the predictability of it, was because once I started I couldn’t stop, I read this in one sitting. It easily drags you in, you want to know what has happened to Marlie’s sister, even if you have already guessed, you want to see Kenai and Marlie get together, even though you know it will happen eventually. And you want to see them catch the bad guy, even though you have already guessed who it is. So, if you like a serial killer mixed in with your romance (and who doesn’t?!) I highly recommend you give this a try. Nice! After reading the review for melinda leigh on here, which I bought and really liked, I’ve been on a bit of a romantic suspense kick. I’m glad you picked up the Melinda Leigh! It was so good, I loved it. This is another great one if you fancy something along the romantic suspense lines. Oooo, this looks good. Thanks for the review! Sounds good, adding to my wishlist.